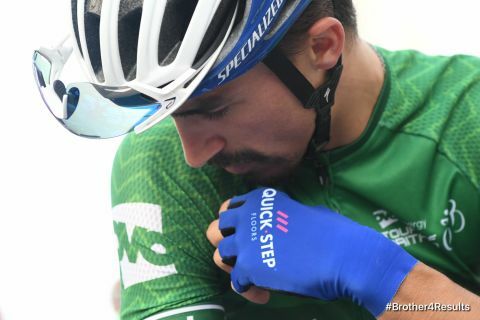 One of the most consistent and successful riders of the season, the 26-year-old Frenchman Julian Alaphilippe looks back to his exploits as he continues his preparation for the World Championships. The week of the Ardennes Classics is a week I will never forget, because it has been the best of my life. Winning Flèche Wallonne was a dream come true and sharing this experience with the team and with my best friend, teammate and roommate Bob Jungels was super nice. The whole squad worked for me that day, and after coming second twice on the Mur de Huy, I really couldn’t believe that this time around the victory was mine. A few days later we rode Liège–Bastogne–Liège, another prestigious race that I knew Bob was eyeing, so I was happy I could return the favour and help him achieve his goal. What a victory that was! Maybe it’s difficult to comprehend from the outside, but seeing your best friend win – after a textbook race of the entire team – makes for a really indelible moment, one of which I am very proud, because we showcased once again our unique #TheWolfpack spirit. We always work so hard, make a lot of sacrifices, not only us riders but also staff, so when we win we always do it together as a team. To win one stage at the Tour de France has always been a big dream of mine, but I could have never imagined taking two stages and the iconic polka dot jersey. Ever since the route presentation last October, I had these two stages (Le Grand-Bornand and Bagnères-de-Luchon) in my mind, but between knowing they were for me and actually powering to victory is a big difference. 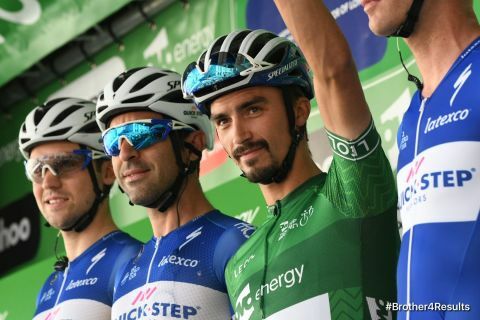 Getting the yellow jersey with Fernando Gaviria on the opening day was great, a superb start to the race which eased off some of the pressure and motivated us more. After making it safe through the first week while giving a help to the team on the flat stages, came my moment in the sun at the beginning of week two, with the KOM jersey as bonus. I remember arriving at the hotel that evening and seeing the entire staff happy that their hard work got rewarded with that beautiful win, which was touching. The Tour de France is hard and long for everyone, but those three weeks were incredible and arriving in Paris with that jersey which so many huge riders had won before me was something crazy. I came out tired from the race, which was very wearing, but between a criterium here and there, I found myself in San Sebastian. Honestly, I didn’t have too many expectation there, but my legs felt good, so I gave everything when I realized I could win. I can’t tell you how many messages I got after claiming the victory there, my phone was buzzing all the time and couldn’t handle it anymore. After San Sebastian I raced some more criteriums in France, and it was refreshing to be there, despite them coming at the end of such a crowded month, because I got a lot of love from the people who attended the races, and that’s why I want to thank them again for their support, their cheers and for coming to talk to me or take pictures. It meant a lot to see how many people appreciate me, and it’s also for them I always go for the best possible results. But after these hectic weeks I needed a small break from it all, just to clear my mind and relax in the sun, so I went on a vacation and just did nothing. I also spent some quality time with my family; I need that in order to feel like myself again, because at the end of the day, this is the most important thing for me. It was after this break that I went to Bob Jungels, in Luxembourg, and resumed training before heading to the United Kingdom for the Tour of Britain. It was my first time there, and I didn’t expect a lot from this race, my first in five weeks, as I had no idea how I would feel being back in the pack and getting into the race rhythm. I was happy to discover the country, to meet many extraordinary and passionate fans of all ages and just ride my bike as part of this amazing team. The stage victory in Bristol came as a surprise, but it made me believe the GC was within my grasp, and I managed to clinch it thanks to the outstanding support of my teammates, who rode their wheels off supporting me, and my display on the taxing uphill finish to Whinlatter Pass; the latter was really a key moment of the race. I could have gone for another stage victory, but my only focus was on the overall, so I rode accordingly, making sure I gained time on my rivals. 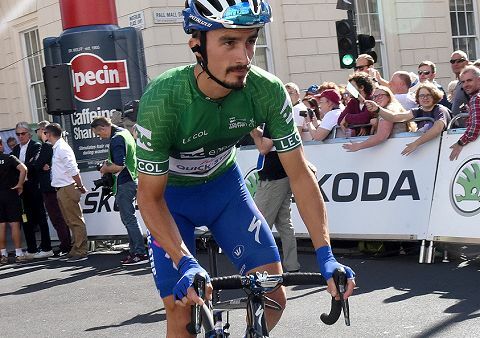 I liked racing in Britain, and I’m not saying this because in the end I left home with the second stage race win of my career after the one at the 2016 Tour of California, but because the fans were magnificent, creating a Tour de France-type atmosphere every single day. That’s why every morning, before the start of the stage, I came out of the bus a bit earlier so I would have enough time for pictures, autographs and some chit-chat. This week finds me in Slovakia – the country of our sponsor Janom – and I’m very excited, because I’ve never been here. We came with an incredible roster and started the race with a bang, taking the prologue and the yellow jersey with Bob Jungels, who delivered our team’s 62nd win of the season. Only when you say it and you get the chills… 62 victories since the start of the year and a new all-time record for the team with more than a month left of this season! It’s quite something, isn’t it? I’m also glad to be racing Slovakia because it serves as a good preparation for the World Championships together with the Tour of Britain. Innsbruck is my next big goal and I am fully focused on this. I can’t tell you how proud I am to be part of the French National Team, and you can be sure I will give everything on the tough parcours in Austria in two weeks’ time. 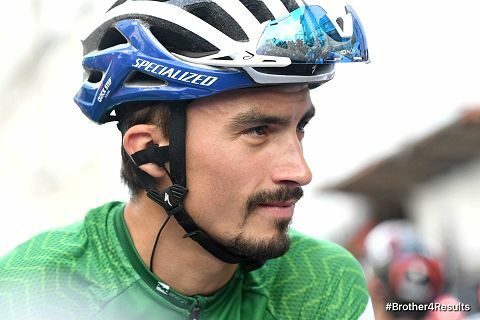 The race will be very hard and when it comes to the Worlds, you can never know what to expect and what will happen, but I hope to be on the top of my game there. We will see how things will turn out, but one thing is certain: winning the rainbow jersey would be the cherry on the top of what’s already been a superb and unforgettable season!